Dr. Javier Gonzalez was born and raised in Puerto Rico. 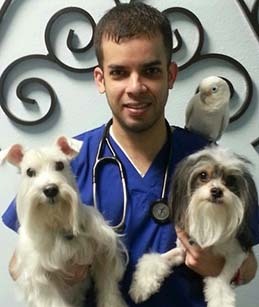 As a young kid, Dr. Gonzalez always dreamed of one day becoming a veterinarian. He did so in 2004. He graduated with a Bachelor’s Degree in Biology from Florida International University in Miami, FL in 2000. He then attended Ross University School of Veterinary Medicine in St. Kitts, a small island in the Caribbean and completed his senior year at Louisiana State University School of Veterinary Medicine in Baton Rouge, LA. After graduating from vet school in January of 2004, Dr. Gonzalez moved to New York and practiced veterinary medicine in Long Island. After living and working there for a year, he decided to move back to the Sunshine State after long winter days convinced him that New York was not the Empire State for him. Dr. Gonzalez practiced at a local animal hospital for the last 7 years and has now opened his new veterinary center in Fort Lauderdale, FL. Dr. Gonzalez enjoys all aspects of small animal medicine and surgery, but has a special interest in preventive medicine. He shares his life with his life partner as well as Charlie (miniature schnauzer), Bentley (shih-poo), Kiki (cat), Lola (cat), Bobbi (Goffin’s cockatoo) and Sophia (blue Quaker parakeet) and many fish tanks. He enjoys spending time with his family and friends, the theater and movies, swimming, bike riding and keeping a healthy lifestyle (except for sweets and diet cola). Come by Fort Lauderdale Veterinary Center today and meet Dr. Gonzalez and the staff. Free tours are given daily. Ashley has spent most of her young life raising and caring for animals. She always knew she wanted to work in the veterinary field. She has been a veterinary receptionist and assistant for over one year now. She loves it! She shares her life with 5 pets, 2 cats (one of which she has had since she was 8 years old), a PitBull named Taz and a chocolate Lab named Bella. As if this wasn’t enough, she is also owned by a Bearded Dragon named Mushu. All of her pets are rescued animals. Ashley is currently enrolled in online classes in order to obtain her license as a veterinary technician. On her free time, Ashley enjoys spending time on the ocean, taking care of her pets and spending time with her family and her boyfriend Robert. 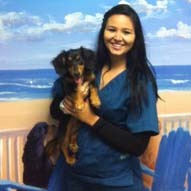 Ashely will greet you with a smile every time you come to see us here at Fort Lauderdale Veterinary Center.